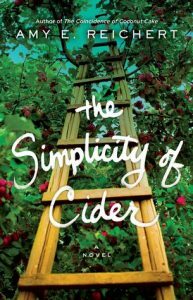 Life seems to be careening out of control for Sanna Lund, whose sole desire is to live quietly in her ancestral home, creating apple ciders in her unique way of tasting colors. An accident temporarily incapacitates her father Einars, the new hired hand Isaac stirs new feelings she’s not planned on entertaining—his son Sebastion distracts her as well, and her brother Anders, who moved away, urges her to sell the struggling family business. Secrets crack her long-held paradigms and Sanna comes to realize certain truths cannot be ignored, and she opens herself up to more than she imagined was possible, including a mother she’d tried to cut out of her heart. This is a brilliant story of a creative synesthete attempting to sustain her insular world, a young woman forced to trust new people, blur her black and white judgment, and broaden her horizon to survive. Reichert carefully weaves the romantic elements into the story while maintaining the integrity of complex characters and challenging relationship dynamics. Novels offer life reminders, and this story teaches us how to let go and open ourselves up to others in order to keep moving forward. It’s a beautiful theme and a gorgeous cast that includes an orchard with heirloom apple trees.